Advantages: Comprehensive coverage including scale plans, rare photos, and excellent artwork. Who would have thought the “Datafile treatment” would be given to this unusual aircraft? When the US declared war on the Central Powers, a delegation was sent to various countries to find the best aircraft and engine designs that could be built in the United States. The results led to the development of a George Lepere designed two-seater, capable of being powered by a 450-hp Bugatti motor. Problems with this engine led to the 400-hp Liberty being used, thus the original LUSAC-21 became the LUSAC-11. 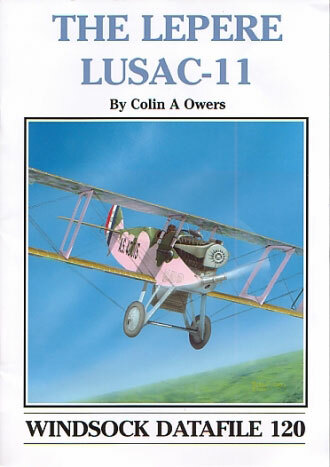 With only seven completed by 11 November 1918, the Lepere Lusac-11 was never to prove itself in combat. It had some use in the post war years however with one machine winning the Liberty Engine Trophy at the October 1922 National Air Races at Selfridge. Many examples were later used by air attaches and others became “test beds”. It achieved fame by attaining several altitude records, these being done when equipped with a turbo-supercharged engine. With the war over, the urgency to sort out the aircraft’s problems evaporated. In total, little more than two dozen examples were built. The author covers this history in a concise and easy to read manner. As with other Datafiles, it comes in the regular A4 size and comprises 32 pages. Contained therein are over 65 black and white photos, offering a rare insight into this unusual aircraft. There is a LUSAC-11 that’s being restored and its present location is the USAF Museum. Ten colour images from this airframe are also included, a couple of them being tantalizing cockpit shots. Colin Owers has drawn and traced the accompanying plans, which are supplied in both 1:72 and 1:48 scales. These are nicely rendered with extra detail views included where appropriate. The colour profiles are equally as competent, with Ronny Bar providing three schemes to tempt the modeler as well as supplying two variations of upper surface camouflage. Robert Karr gets the most from this ugly aircraft with his usual dramatic artwork on the cover. Not an obvious candidate for this series but if the Lepere LUSAC-11 is your bag, you won’t get a better all-round reference source than this one.